UK angler Stuart decided to spend a days Thailand lure fishing at Pilot 111 fishing ponds near Bangkok. On arrival at the Pilot 111 fishing ponds complex the angler was soon casting amongst the many predators in one of the Snakehead fishing ponds. 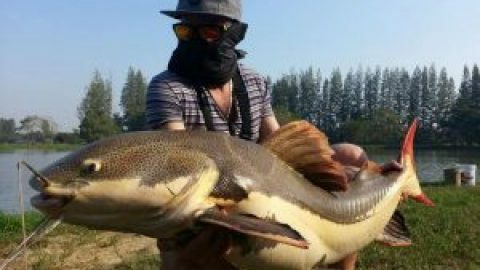 With the Giant Snakeheads being particularly wily and seemingly inactive the angler changed tactics and moved onto one of the Barramundi ponds at pilot 111 Bangkok. 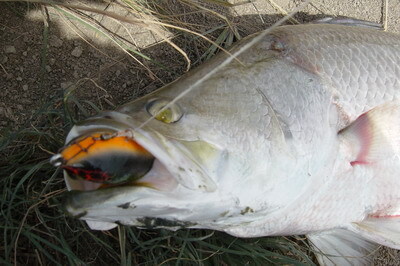 It didnt take long before the angler was soon attached to a highly acrobatic Barramundi of a few kg’s which hurled itself from the water on several different occasions before being carefully brought to the bankside. After unhooking the Barramundi the angler repeated the process a further two or three times before the Barramundi seemed to wise up to his carefully presented lures. Another change of fishing pond soon saw the angler landing several Pacu to 3-4kg’s which hungrily attacked his expertly cast artificial lures. After a change over to the Snakehead fishing ponds after lunch the angler finally managed to nail a Giant Snakehead of 3kg’s which aggressively hit his lure. Further casts into the snakehead fishing pond resulted in more Giant Snakehead strikes which left the bright shiny lures battered. The angler persevered with the lure fishing and managed several further Giant Snakeheads with weights between 2-3.5kg’s before the days Thailand lure fishing trip came to an end. After fishing ended the angler was soon back at his Bangkok hotel ready to continue the rest of his Thailand holiday.